The 3 star Margarita Studios and Apartments are located approximately 880 metres from the main resort of Ipsos and just 900 metres from the local shingle beach, and are built on a hillside offering superb views of the surrounding mountains. The pretty little complex is close to the village of kato korakiana. 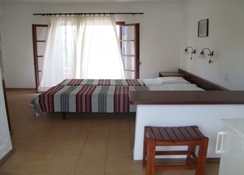 Margarita Studios is a family run, warm and welcoming establishment offering a fabulous pool area and peaceful and pleasant place to stay for a traditional holiday in the Greek Island sun on Corfu. Local tips: From the Margarita Studios it's just a 10 minute walk to the local village of Kato Korakiana and 1.5km from the delightful resort of Dassia. Food, drink and entertainment: Hotel restaurant serving a wide variety of snacks, Greek and international cuisine; a bar area featuring satellite TV and live sports coverage shown on a projector wall. Also a TV room with a pool table. Sports, games and activities: Large swimming pool with sun beds and umbrellas and a games room with Pool Table (extra charge). Additional: Reception service (08:00 til 24:00) guests arriving outside these times should provide arrival time in 'Special Requests' to ensure staff are on hand to check them in on arrival. free WiFi in the bar area, safe deposit boxes (extra charge) and currency exchange. My friend & I had a brilliant holiday at the Margarita. Everything was great , apartment,pool, food and staff.